Hi, I'm Emily Westhill. My father-in-law and I own Deputy Donut, a donut and coffee shop in Fallingbrook, Wisconsin. Brrrrr! It's been a cold winter so far. Up here in northern Wisconsin, we're used to freezing temperatures, but still . . . It's warm inside Deputy Donut. We're making coffee and other hot beverages and donuts all day, but that's not all that warms this sweet little shop. Our customers are wonderful! Yes, the retired ladies who call themselves the Knitpickers often seem to be bickering with the group of retired men who sit at a table near the Knitpickers' table, but if you listen closely, both groups are teasing each other and loving every moment of it. And we get a lot of warmth and camaraderie from the first responders who take their breaks here. The cops claim to be experts on coffee and donuts, which means that they know they don't like the coffee at police headquarters, and they know they do like our coffee and donuts. And then there's my cat . . . What could be warmer than a cat? Because of health regulations, Dep (it's short for Deputy Donut, and the shop was named after her, not the other way around) doesn't come into the kitchen or dining area, but if anyone needs to cuddle a cat, they can join her in our office, and if she's not running around on catwalks that Tom and I built near the ceiling, she's usually available to purr in a pair of human arms. I'd like to say that she helps solve mysteries, but she's as likely to take exception to a police officer as to a murderer. She adores one detective, but runs away from another. Yes, one of my favorite customers, a Knitpicker, was murdered, and it was a stressful time for all of us, but in addition to being a warm place, a donut shop that serves as a community center is also a source of information. Tom, who retired as Fallingbrook's police chief, and I keep our eyes and ears open . . .
And so does Dep, when she's not playing or napping. 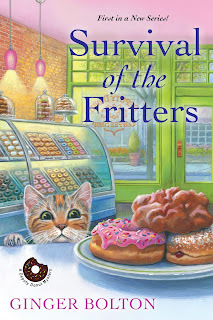 Survival of the Fritters will be on store shelves January 30, but is available for pre-order now. In the meantime, Ginger Bolton has two advance reader copies she'll send to U.S. or Canadian addresses. Comment below and two winners will be chosen at random. I am excited to read this book! mcastor07(at)gmail(dot)com. I love the title! Thank you for the chance to win this. Survival of the Fritters sounds absolutely delightful both in the yummy donuts and the mystery solving skills of Emily and Deputy Donut. Just look at the deliciously adorable cover! Makes my lips smack just wanting to eat a donut while petting a purring cat. :) I know that I would LOVE to read it! Thank you so much for the chance to win a copy! Hoping to be one of the fortunate ones selected. I love the cover on this book! I really like mysteries with animals (dogs or cats) and sweets. This sounds like my kind of read. I love the name of the coffee shop! The book cover is fun too. Sounds like a great book for winter reading. Sounds like the start of a good series. I love the cover picture! I'll take my coffee and donut in the office with a side of cat snuggles! I have this on my TBR list. This sounds like fun, and my SIL is a cop in the NYPD. The title had me smiling and ready to read this amazing book! I love nothing better than fried pastries. Doughnuts are my usual favorites, but there is a place in a small town near us that makes apple fritters worth the drive. I really like the cover and title. Sounds like a great start to a new series. 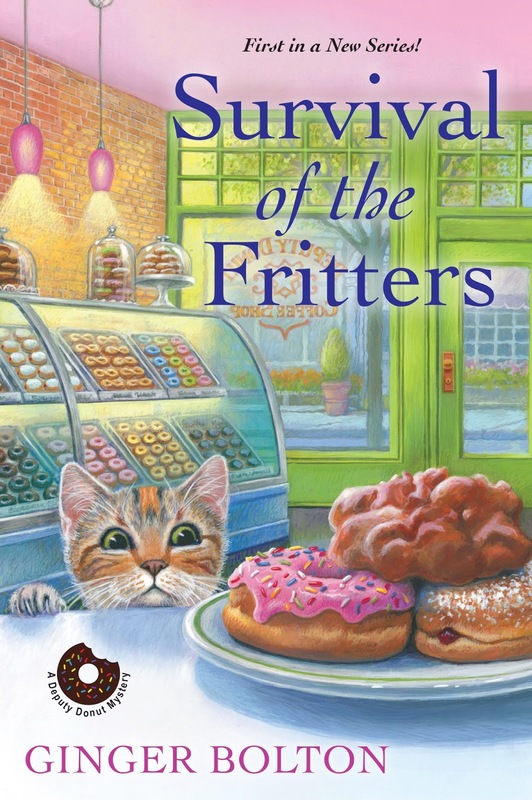 Survival of the Fritters sounds like a great book with fun characters. Thanks for the opportunity to with an ARC! That kitty on the cover is calling out to me to read this book. Sounds delightful. I'd love to read it! Sounds like a delicious read, can't wait. Thanks for the chance to get it. This series sounds fantatsic! I am so excited to read it! Thank you so much for the chance to win! This book looks so good! Thanks for a chance at the giveaway! This sounds like a great book. I also love the cover. I can't wait to read it. Deputy Donut and the book sound cozy and inviting! I look forward to reading it! Thanks! Your character has caught my interest. I’ll be watching for your book. Although I now live in Arizona, I lived for 20 years in south central Wisconsin. Love the donut shop setting...and Wisconsin, of course. A Wisconsin retired teacher friend of mine enjoys reading “Wisconsin “ themed books. I’d be happy to share a copy with her. Lldawnjm (at) gmail (dot) com. Thanks for writing! Thank you all for your interest! It turned out I have 4 Advance Reader Copies of SURVIVAL OF THE FRITTERS. The winners are: Ellen Jacobson, Lisa Arnold, Kay Bennett, and Faith Creech. I'll be in touch for your mailing addresses. This looks like the cutest book. I'm sure my kitties will be reading over my shoulder. Thanks for the chance!